A solemn procession of naga and blood elves trudged across the broken, rocky terrain of Outland. 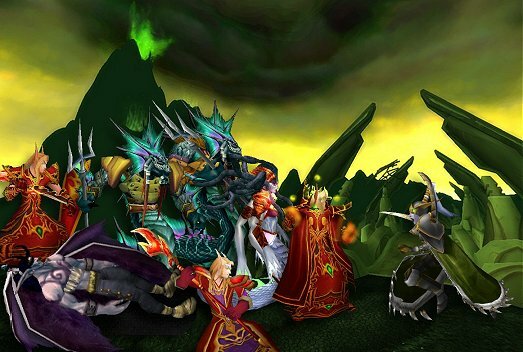 The only survivors of the clash at Icecrown, they were demoralized and exhausted. Lady Vashj and Prince Kaelthas marched at the front, followed by four naga myrmidons bearing Illidan on a makeshift stretcher. The two leaders would occasionally look over their shoulders to see if their master was still alive. Illidan had not regained consciousness since being struck down by Arthas, and as the hours passed it became more doubtful that he ever would. The gash across his tattooed chest was a serious enough wound by itself, but it had been made by the cursed runeblade Frostmourne, and even one as skilled in the arcane arts as Kaelthas was unable to predict the effects. Vashj made a low hissing noise that Kael had come to recognize as a warning. "I caught a ssscent just now," she said quietly. "Night elf." "Just one?" Kael peered into the barren landscape but saw nothing. They continued on in wary silence. It was not easy going over the harsh landscape, tired and frostbitten as many of them were, and slowed by their fallen leaders stretcher. There were no trees in sight, only jagged boulders and dusty expanses of land. Suddenly a shriek rang out through the stillness. Vashj immediately reached for her trident while red energy began to crackle around Kaels hands. The stretcher-bearers set down their burden and drew their tridents. Weapons at the ready, all turned toward the sound, only to be stunned into momentary inaction by what they saw. A lone night elf ran toward them, stumbling in obvious fatigue. Her green cloak was torn and ragged, her armor scratched and covered in dust. "No!" she screamed, dropping her weapon in the dirt as she raced toward them. "No, no, no!" "Warden Shadowsong?" Kael gawked in amazement. He was not particularly surprised by the fact that she had survived the dangers of Outland, but her stricken expression upon seeing Illidans still form was definitely unexpected. Several naga surged forth to intercept her, but Kaelthas stopped them. Even he was not sure why, for despite her unarmed and exhausted state he had no reason to trust Maiev. "Illidan! No!" She darted between the stretcher-bearers and threw herself over the prone form of the demon hunter. "No, no, no, this cannot be!" she cried, cradling his head in one hand, rubbing his face and shoulder with the other as if trying to awaken him. Unsuccessful at coaxing any sign of awareness or life from him, she smacked him hard across the face. There was no response. Maiev made a keening wail of grief and collapsed with her head on his shoulder, gasping with ragged sobs. Stunned, the naga and blood elves merely stared. Finally, Vashj pushed past the myrmidons and poked the night elf with the blunt end of her trident. "What is the meaning of thisss?" Maiev gave a start, as if this was the first time she had noticed the others there. She scrambled into a crouching position, reaching for her chakram before realizing she had dropped the distinctive round blade many yards away. "Stay away from him, you slimy monsters!" she snarled, looking prepared to fight them all off bare-handed. Kaelthas stepped around the flabbergasted naga and faced the interloper, faint magical energy crackling between his fingertips. "Warden Shadowsong, you dont really believe you can capture him all by yourself, do you? Outland has obviously not been kind to you, and youre vastly outnumbered." "What happened to him?" Maiev asked hoarsely, ignoring his question.
" Kael sighed. "We fought against the Lich Kings forces in Northrend. Lord Illidan faced King Arthas in battle and was struck down by the runeblade Frostmourne." Vashj sneered. "Yesss, how rude of him. Everyone knows you wanted to ssslay Illidan yourself." " Her voice cracked, and when she spoke again her words carried renewed ferocity. "Illidan is mine! He is mine, and mine alone! Only I can decide his fate. Only I understand him." She turned, leaning over his lifeless form, and inspected the rough bandage around his chest. "Youre mine," she said softly. "Ssshes completely mad," Vashj said, shaking her head. Kael was silent, watching the display with a frown of deep thought. Maiev clasped Illidans hand to her chest and mumbled words that Kael could not entirely make out. The dust on her face was streaked with tears from beneath her helmet. She whispered something to herself, then raised her voice. "Illidan, wake up. Wake up, damn you! You cannot die. I wont allow it! Illidan, can you hear me?" Irrationally angered at his failure to respond, she began to shake his shoulders. "Say something, you vile, worthless Betrayer!" "Warden Shadowsong!" Kael snapped. Taking this as their cue to act, the two nearest myrmidons dragged her off Illidan, lifting her by the arms until her feet no longer touched the ground. "Put me down, you abominations!" she snarled. One of the naga hissed in pain as her armored foot connected with his chest. The other naga brought the flat of his trident down on her helmet, and the elf went limp. "Tie her up," Vashj ordered. "We have no time for this foolishness. We must get the master to sssafety." Kaelthas looked down at their leaders motionless form. Returning to the Black Temple was the best course of action, but he doubted it would make any difference in Illidans condition.